Linda Shenton Matchett: Mystery Monday: Who is Helen McCloy? When one's parents are an author and a newspaper editor can a daughter choose any career but that of a novelist? Similar to children of actors who grow up to be actors, perhaps it is the same with writers. Born on June 6, 1904, Helen Clarkson received a top-shelf education. She attended the Brooklyn Friends School run by the Brooklyn's Quaker community then following graduation traveled to France and studied at the Sorbonne. Remaining in France, she obtained a job with Universal News Service (a Hearst company). Five years later she quit to become an art critic and contributor to the London Morning Post. Returning to America in 1932, Helen began to write mysteries and created the pseudonym Helen McCloy. Her first novel, Dance with Death, was published in 1938. Success came quickly, and she published one book a year for the next ten years. Helen continued to publish books until the late 1970s, half of which were part of her Dr. Basil Willing series, the other half were stand alone novels. Hailed by many critics as one of the greatest writers, Helen explored topics such as the psychology of Fascism, human sensory perception, and the concept of doppelgängers. Her characters have detailed life histories that are explored throughout the novel. Vivid description enables readers to immerse themselves in each scene. 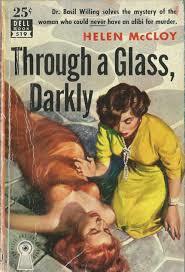 Helen was an active member of Mystery Writers of America and was its female president in 1950. In 1971, she helped found MWA's New England chapter. She was named MWA Grand Master in 1990, and the organization offers a scholarship named in her honor. She passed away in 1994, leaving a long legacy in the mystery writing community.